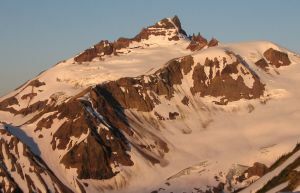 A volcanic rock peak of the Meager group which is the southernmost summit in the group of peaks and overlooks Meager Creek hotsprings. Two pinnacled ridges extend out from Pylon and are named respectively the Pylons and the Marionettes on the Geological Survey of Canada special area map. From a high clearcut on the north side of Meager Creek, across from the hotsprings, a short hike through forest and then an ascent over snow and scree followed by a rock scramble leads to Pylon's pointy summit. Despite the ease of access this peak is infrequently climbed.